One of the more unusual species, Grevillea nudiflora is from Western Australia and is a prostrate shrub with red flowers. 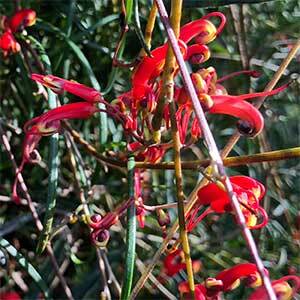 Used as a ground cover plant, Grevillea nudiflora is also found as a grafted weeping specimen. Being vigorous and low growing it makes a good plant for growing along the top of retaining walls where it can be allowed to cascade over the edge. 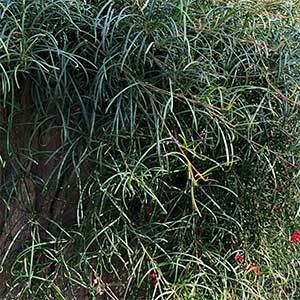 It copes well in coastal areas and is also suited for mass planting in commercial situations. The root system is also vigorous and it should be planted away from drains and sewerage lines. This is a species that has a very dense growth habit and can be used as a ground cover plant, grown to flow over a retains wall, or plant it as a cover up plant in an old tree stump. It is free flowering and it will attract birds and bees to the garden. Once established it makes a living weed mat, so use it in ares where this is an advantage. It is not widely offered for sale, however we think it is well and truely garden worthy, in a native garden or as an interesting feature plant. The dense foliage makes it a haven for small birds. This is one of the easiest of all of the Grevilleas to grow. Give it the space it needs and full sun and maintenance will be minimal. If areas with poor drainage or heavy clay soils, hill up the soil to improve the drainage. A little light tip pruning after flowering will help keep the plant develop a good bushy habit and encourage more flowers the next season. Fertiliser – Specialist low phosphate native plant fertiliser once a year. Flower – Red with yellow to orange. Suited to coastal conditions – Yes, 2nd line.